"HI, MY NAME IS LOWRIDER AND SANTA, I HAVE BEEN VERY GOOD THIS YEAR. I ONLY ATE A FEW OF MY SWEATERS, A HOUSE COAT AND MY DADDY'S JOGGING PANTS, BUT, I PROMISE TO DO BETTER NEXT YEAR! PLEASE BRING ME SOMETHING GOOD AS I AM BABY LOWRIDER AND I DESERVE SOME GOODIES." Lowrider, what a sweet little wiener dog face you have. Sasha said we had to vote for the doxie first. My silly girl. We wish you lots of luck. What a sweet little face.....aw a baby doxie!! I love the little bonnet with the soother......cute, Terri. Have fun in the contest, and hope Lowrider meets lots of new friends. Aw, a baby bonnet!! And such a good baby! We are voting for you because your Mommy made you wear that thing on your head. Our Mommy makes us wear things too. Lowrider, we finally meet face to face. What a beautiful girl you are! I think you are already a winner :) Best of Luck and give my regards to your mom. You rock, Low Low! Good luck and I hope you win! Best of luck to you, Low Rider! HI BABY LOWRIDER JUST MOMMY GIVING YOU ANOTHER VOTE AS YOU WERE A REAL GOOD GIRL TODAY! How adorable is that face!!! I love the baby bonnet. What a sweet baby! You said what??? I can have the bonnet if you win??? I was here yesterday and just had to come back to see if you were still wearing you hat....Tom M.
Only for you, Lowrider, do I patiently endure waiting out my "dinosaur" internet connection, just so I can vote! Hope you win! Ah, what a cute little puppy you are, lowrider! 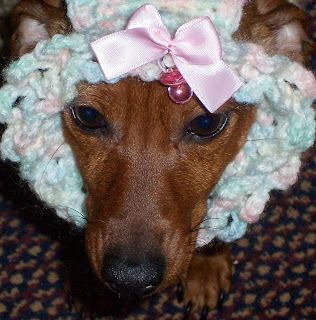 I love the bonnet! Good luck! =)Amy S.
A vote for you today. Come on baby doll! We're all routing for you! I think doxies are just the cutest! Tom M.
Your a doxie just like me so I vote for you today :0) WEINERS UNITE!! Here's a vote for the cutie, LowRider. I just found this site and am really impressed! I just got a baby daschund and will be looking for lots of goodies for him! Donna K.
Is that a pacifier you have? Am just in awe! Tom M.
Pretty girl, may all your dreams come true this Christmas! My vote goes to the wiener! LOL! Lowrider, what a beautiful baby face you have. Power to all furbabies! daddy here, come on lowrider you are too cute to be loosing! One more vote for the cute little weiner. Good Luck Lowrider! Merry Christmas to all little furbabies, and a special wish for you this year, Lowrider. Tom M.
Best of luck to my new little friend. Lisa T.
Another vote for the cute bashful furbaby! dad here, still hanging in with you!